The original “Monster Miata”, detailed in this post: http://www.drivingenthusiast.net/sec-blog/?p=2089, was one of the most significant aftermarket creations for Miata enthusiasts in the 1990s. With a transplanted Ford 302 V-8 engine, a matching transmission and differential, and even a full heavy duty IRS from the Ford Thunderbird in some models, the Monster was the top of the line Miata anywhere in the world. Call it the Sunbeam Tiger for the 90s, or in modified form perhaps even a (Mark II) Shelby Cobra. Shelby Cobra? Why not – the 302 could certainly be built to put out 500 HP and in a 2500 pound car would provide “supercar” performance. But we’re getting ahead of ourselves because the original Monster Miata company went bust after creating somewhere over 275 cars. Those cars demand a premium today if you can find one. If not, consider building your own because swapping Ford V-8s into Miatas is alive and well and the state-of-the-art is quickly advancing. 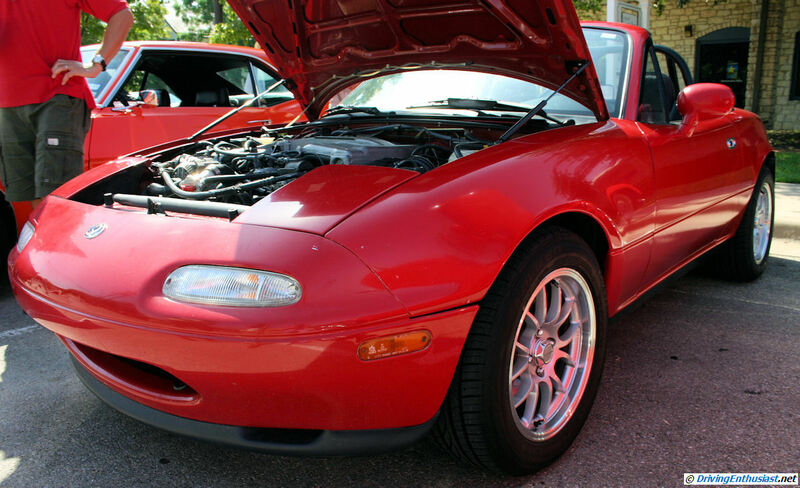 Swapping Chevy LSx V-8s into Miatas is an even newer solution and may be more attractive since they can cover a wider range of Miatas for emissions compliance. Including the original Monsters, some claim that there are as many as 1000 V-8 Miatas (Ford and Chevy) in existence today. That seems high, but certainly the number will be reached sooner or later due to the shear number of swap kits, parts, and resources available. We’ve been thinking about building one ourselves – although not for roadrace track use because the jury is still out as far as pushing a car that was never designed for such torque to extreme torsional limits. It’s been done, and even successfully, but after living thru 30 years of track events we would approach such a thing with great caution. Our thoughts instead revolve around a fun car for back roads driving. We’ve been looking for an engine swap project that would result in a car we could actually live with and this one looks like a great place to start. The Ford 302 swap is a known science, and the current holder of the Monster brand rights has a kit with nearly everything you’d need. There are also at least two companies that make the parts needed to swap a Chevy LSx engine into a Miata, right thru the NB generation (with NC in the works). Emissions compliance is an important question for much of the country. The laws in most states require an engine swap to use an engine that is of the same year or newer as the car it is going into. 1995 was the last year Ford made a 302 with a manual transmission (95 Mustang), so that engine, transmisison, and processor could be used in any 1995 or earlier Miata – but not a 1996 or up. Fortunately, 1995 and earlier Miatas can be had for 3-5 thousand dollars and even less, depending on condition. 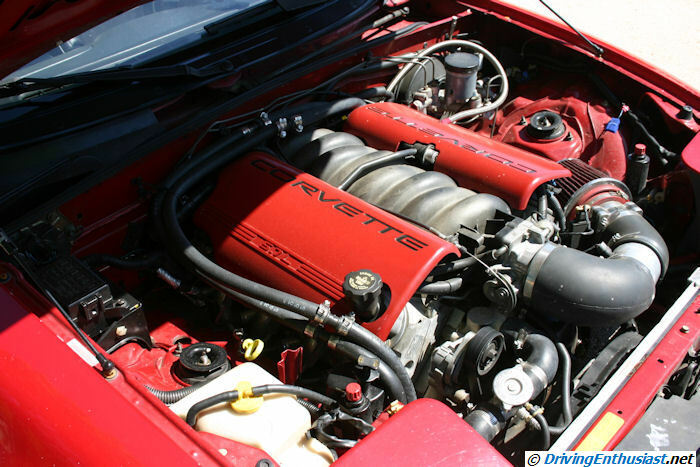 For Chevy engine swaps, pulling a donor engine from a current Camaro, G8, or even a last-gen CTS can cover any year of NA or NB Miata. We’ve encountered several V-8 Miatas in our local Cars and Coffee car shows. If you’re not familiar with Cars and Coffee, check out 3 years of photos of Cars and Coffee events in the Events link at the top of this page. We’ve also seen 2 V-8 RX-7s in these events, and that also has our interest. But today we’ll focus on the Miata. Here’s our first example, an NA Miata with a Chevy engine. If the hood wasn’t open, you couldn’t tell what had been done. The Chevy engine is nearly as low as the stock engine. Note the width of the tires – for this much power you need as much rubber as possible and that’s one big issue with V-8 Miatas. And note the rollbars – a very good idea with this much power on board. Some V-8 Miatas use dual exhaust, others single. 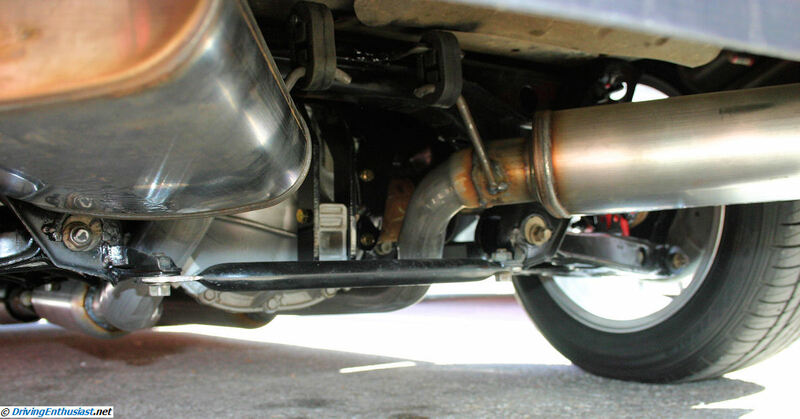 There are several variations of exhaust systems and you will need a very experienced muffler fabrication shop to get it right. For Chevy conversions, there is (very conveniently) a complete aftermarket setup available. Ground clearance is always the single most important consideration. There are two ways to transplant a Chevy V-8: it either fits in place in the stock (untouched) engine compartment, or to achieve a better weight balance, you can move the engine back a bit further. This requires cutting and welding, along with extensive transmission tunnel widening. The good news is that wiring harness adapters are available which almost make this a plug-in conversion, and at the very least will save you a considerable number of rewiring headaches. All V-8 Miatas, regardless if engine type, have less than optimal placement of the air filter. 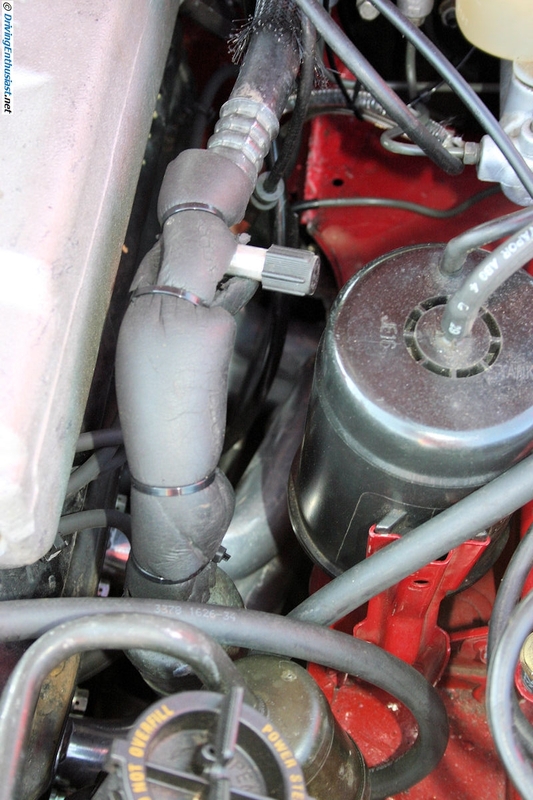 You’ll note that in this example, hot air from the exhaust header is going to get into the engine. We keep looking, but we havent’ seen anybody fence off the air filter. And we know from personal experience the negative aspects of sucking in hot air. But nits aside, this is a very professional and clean conversion. Here’s the air cleaner issue from the other side. 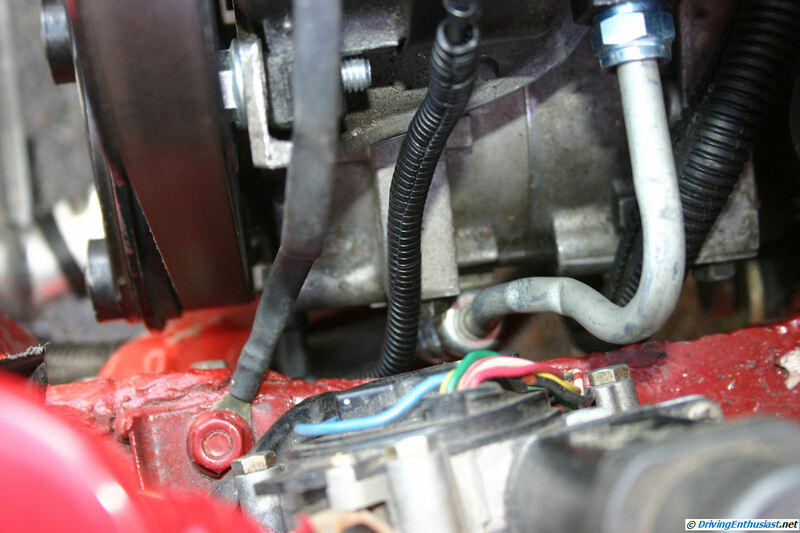 Also note the location of the fuel line coming up to the engine… some kits leave it on the left as in stock Miatas, some move it. In either case it has to pass closely by the very hot exhaust system. Speaking of which, here is the exhaust header on the driver’s side. Very close, but certainly not impossible to work with. And unlike the last-gen Camaro, you can actually replace the plugs without moving the engine. That’s the type of thing that makes this an easy engine swap to live with. Note the clearance notch in the frame just ahead of the air cleaner. And the interior. The shifter position looks entirely stock, and it’s a T-56 underneath. Looking into this car and not under the hood you’d be hard pressed to detect an engine swap. Start it up, however, and the difference is immediately and loudly apparent. While we were unable to show it, the most popular differential for Chevy engine swaps is a all-aluminum Cadillac CTS differential, with limited slip, and easily available from salvage yards. Our example is not just any 302 swap, it’s a 1995 302 into a like-year Miata. 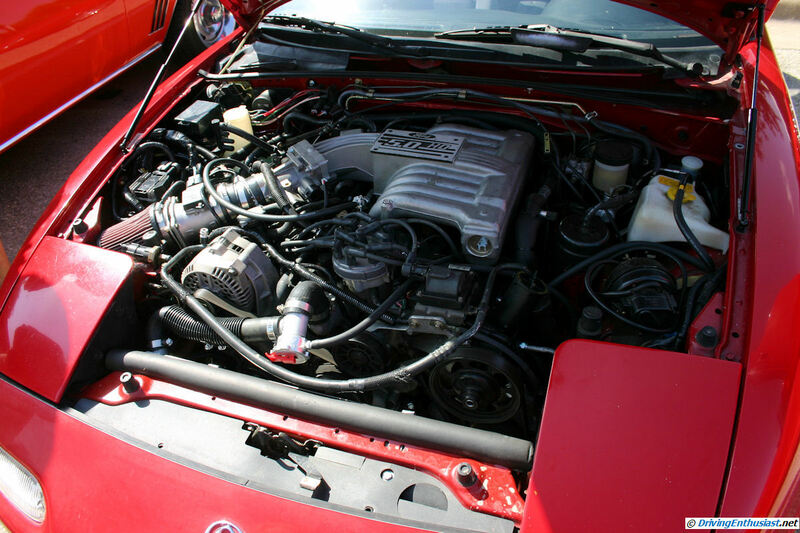 The 1994-1995 302 engines from Mustangs brought with them a different and much more complex electrical system as compared to the system used in the earlier FOX-body Mustangs. 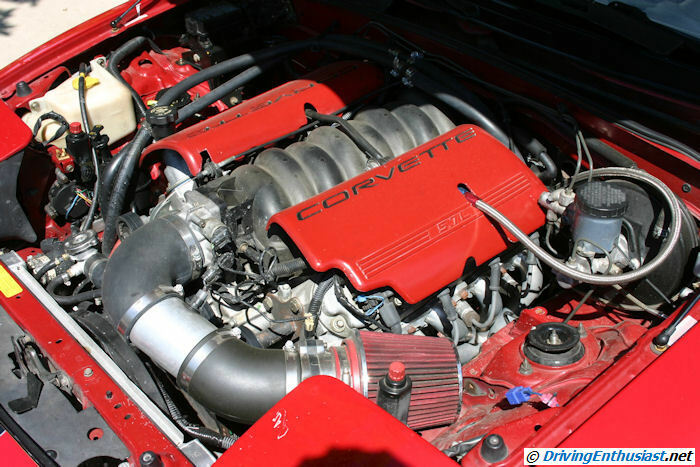 A much easier swap would be a 1993 or earlier Miata with a 1993 or earlier Mustang motor. But the builder of our example below wanted a challenge, and created perhaps the only Miata in the country with a 1995 Mustang engine and electrical system. 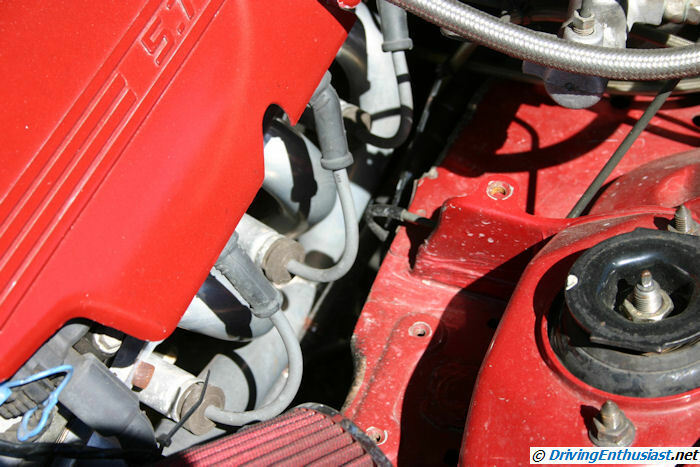 You’ll immediately recognize the 94/95-style Mustang 302 V-8 from it’s intake manifold. This is an iron block and head engine, with an aluminum intake manifold. This is an older engine that the much Chevy LSx series of engines, so the emissions and wiring systems are a bit more dated (note the distributor instead of a modern coil pack). But at least it clears the hood. 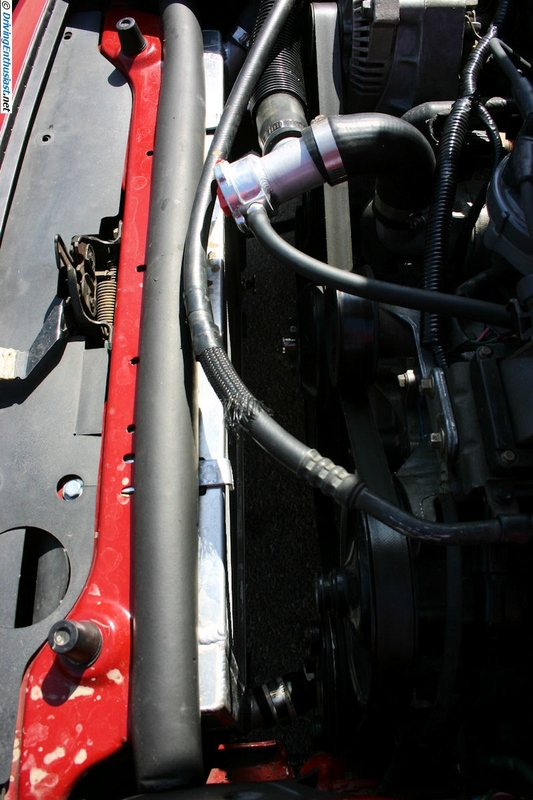 Also note the cable-type throttle linkage – a natural fit into the early Miatas. Hood clearance is not an issue, and the Ford engine is a bit smaller than the Chevy engine. But, the accessories are hung much farther away from the engine and that presents some issues during the build. The engine is situated as far back against the firewall as possible, but unlike the Chevy swap no cutting is required along the back of the engine compartment. 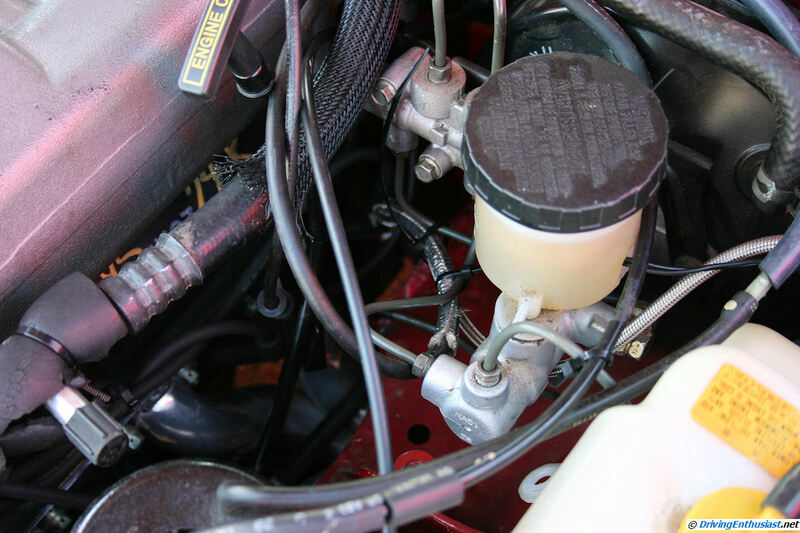 But you will also notice that a much larger cut and weld is required to clear the power steering pump to the far right of the compartment. Here’s another view of the cut from above. Note the single coil in the stock SN-95 Mustang location. Looking further back on the passenger side, we see the master cylinder location is stock, and that the headers are a little less of a tight fit than the Chevy conversion. Doubtless with either version there will be some skinned knuckles getting the steering shaft back in. There is also some special work needed around the air conditioning lines. Air cleaner placement is much better in this swap. 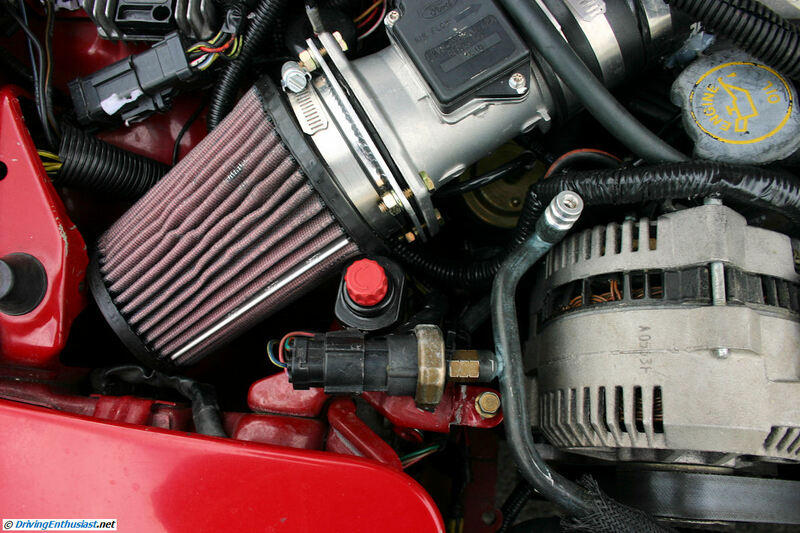 The old Ford-style MAF is a little more complicated with it’s large aluminum housing (versus the Chevy thermoplastic) but the air filter element is away from the hot engine and can better receive much cooler air in this location. 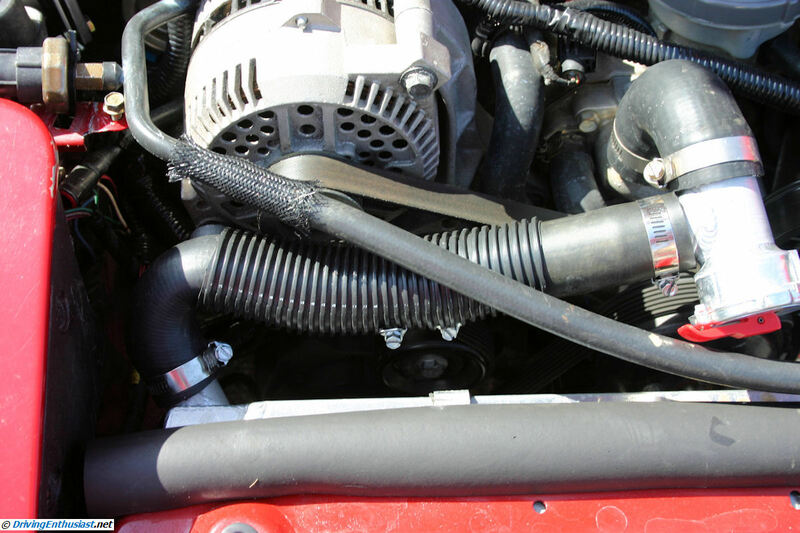 A view of the front with radiator hose placement. 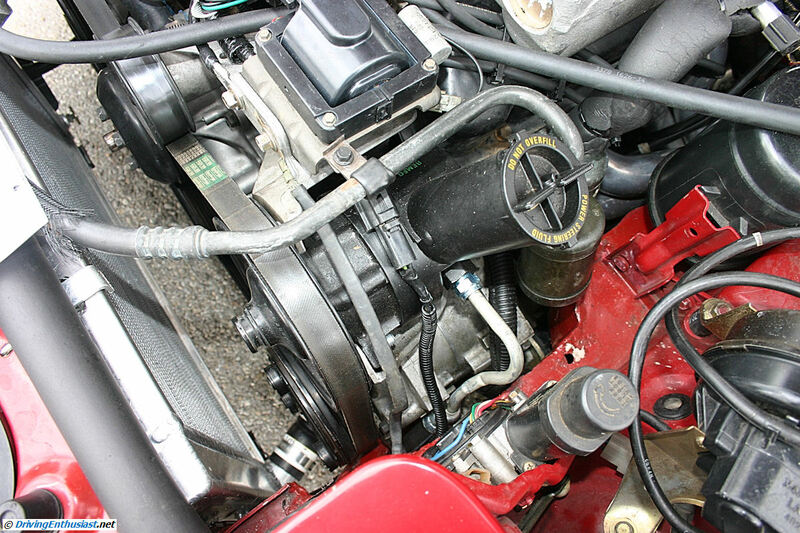 Again, unlike the Chevy engine, the Ford water pump sticks out fairly far from the engine, making the entire cooling system a very tight fit. Some special work is needed up front, including this 90-degree adapter. Like all V-8 Miata swaps, special attention is needed for a specially built radiator, and cooling is an area which needs special focus. Out back, we have a Ford 7.5″ differential from an MN-12 T-bird, and a custom-built dual-exhaust system. The owner wanted his car to be reasonably quiet, and asked Muffin Muffler in Austin to tackle the job. We’ve had work done by that company ourselves, and their work is always immaculate. Needless to say, it’s an expensive and time-consuming job to create an exhaust system that will provide maximum ground clearance, so it has to be done right. Special welding is required on the subframe is needed to mount the differential, and of course like all V-8 swaps both the driveshaft and the half-shafts have to be custom built. 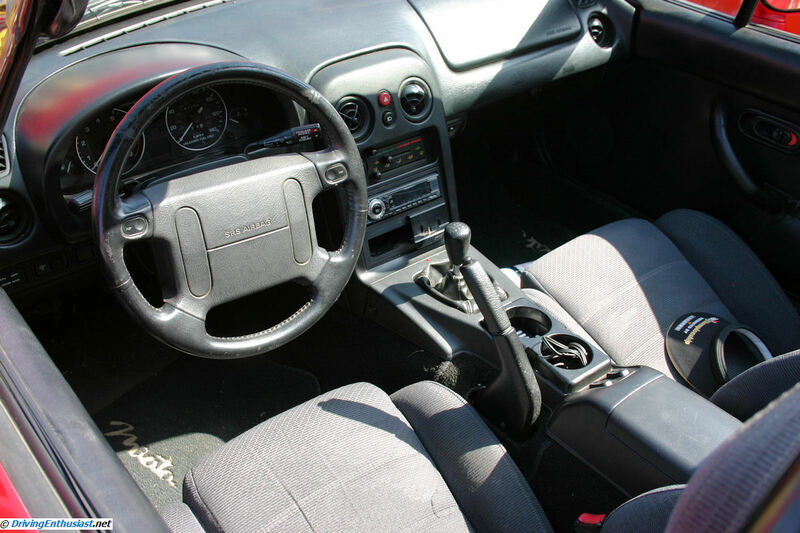 Inside the Miata, it looks very nearly stock. The T-5 transmission is in exactly the right place. Our series of images provides only a very basic overview of the end results of the Ford and Chevy engine swaps. Many more details are available on the web, including forums for discussion and help. The new Monster Miata company – the premier source for Ford conversions. Note their 50-page manual, with color pictures and technical diagrams. This is a must for Ford conversion builders, and would certainly be a good idea for Chevy swaps as well. 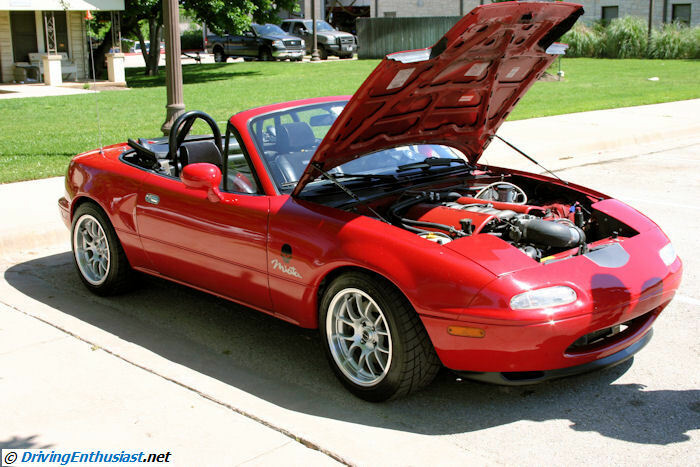 Flyin’ Miata– a source for Miata upgrades as well as V-8 conversion kits. Note the detailed stories of several conversions – severla have detailed pictures showing the required frame and tunnel modifications. V-8 Roadsters, supplier of extensive conversion parts and kits including heavy duty control arms, frame reinforcement, and big brake kits. Note their discussion board forum – required reading before even considering a swap. 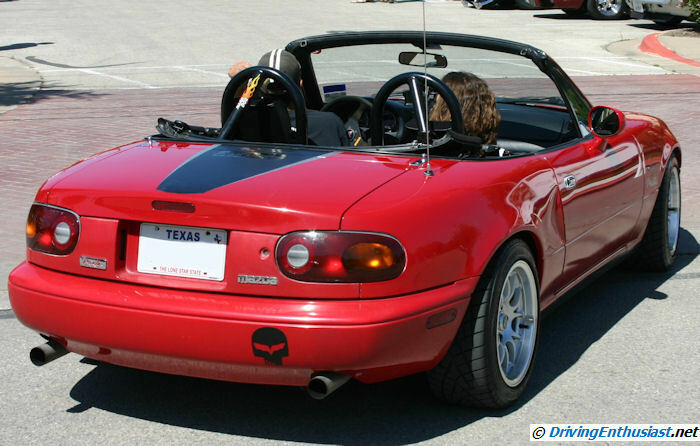 V-8 Miata blog category: now incorporating our previous Monster Miata posts. 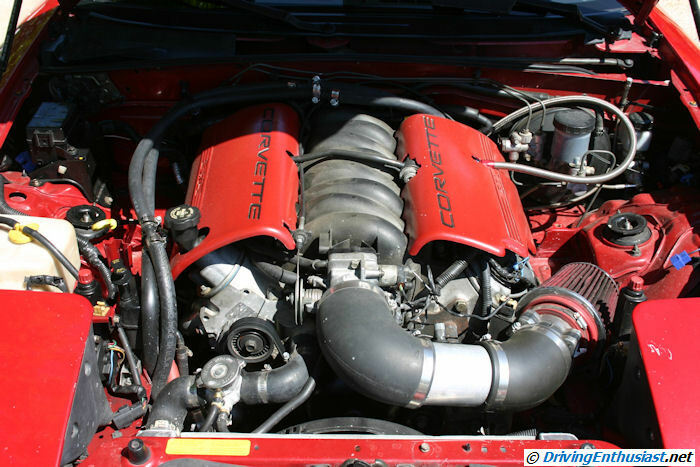 Miata blog category: not specific to V-8 swaps, but covering all of our “regular 4-cylinder” Miata posts. 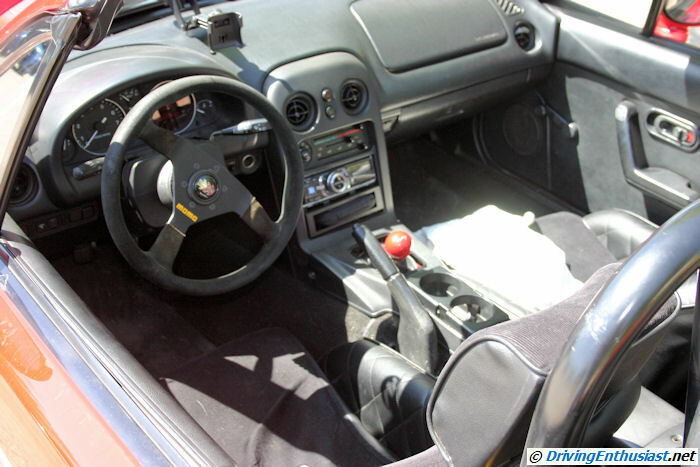 NC Miata cutaway tour:- extensive images of the NC Miata from the press introduction in the summer of 2005. The totally redesigned and much stronger-built NC is just crying for a V-8 conversion. Who will take on the first NC conversion?